WriteRoom is a writing tool. You can call it a word processor but, unlike virtually every other word processor out there, it doesn't have tons of features. There are no menu items with submenus and sub-submenus, nor are there tabs with nested tabs, or multiple edit bars, or pop-out formatting panels, or pretty much anything else you've come to expect from a word processor. WriteRoom is a writing tool, but it is not Microsoft Word, or even Apple Pages. 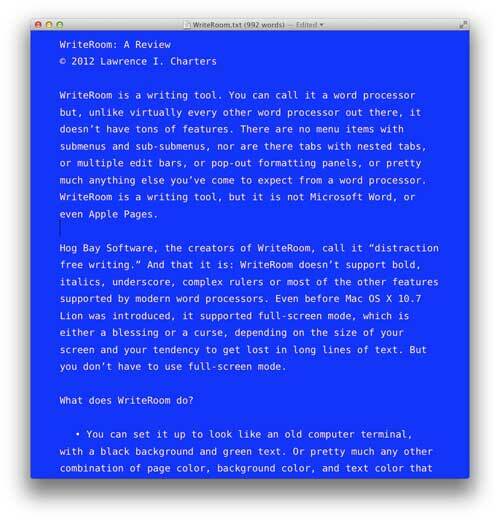 WriteRoom looking something like WordPerfect on an IBM PC. Click on image for larger version. Hog Bay Software, the creators of WriteRoom, calls it "distraction free writing." And that it is: WriteRoom doesn't support bold, italics, underscore, complex rulers or most of the other features supported by modern word processors. Even before Mac OS X 10.7 Lion was introduced, it supported full-screen mode, which is either a blessing or a curse, depending on the size of your screen and your tendency to get lost in long lines of text. But you don't have to use full-screen mode. WriteRoom looking something like a sheet of parchment, assuming that people typed on parchment. Click on image for a larger version. You can set it up to look like an old computer terminal, with a black background and green text. Or pretty much any other combination of page color, background color, and text color that you wish. You can save your work in either plain text or Rich Text Format (RTF); aside from an option to export a PDF, that's it. You can save text in a number of encodings, but generally speaking, you probably want to stick to UTF-8. You can display, in the top margin, the document title, character count, word count, line count and page count. Or not. 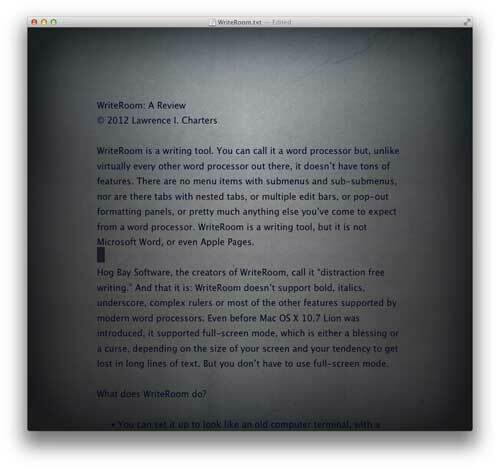 WriteRoom automatically saves documents when quitting, and supports Mac OS X 10.7 Lion's versioning. You can have tabs, or not. You can have a blinking insertion point, or not. You can show invisible characters, or not. You can check spelling as you type, check grammar and spelling, correct spelling automatically â€” or not. If you wish, you can have the Mac speak the text to you â€” a great proofreading aid â€” using the Mac's built-in speech synthesizer. This is a feature, by the way, that Microsoft Word 2011 and Apple Pages do not have. Since it is a writing tool, it has the usual essentials, including a superb search and replace function, and supports spelling and grammar checking, either in batch mode or as you type. It even includes an auto-correct feature for spelling, and while I have a generational antagonism to such robotic assistance, others may not have such a bias. WriteRoom set up to look like something you'd use for writing a vampire novel. Click on image for a larger version. The Edit menu also directly links to the Mac OS X's wealth of special characters, bringing up the character palette so you can insert arrows (â†’â˜žâž âžªâž½), currency symbols (â‚¬Â¥Â£), pictographs (â˜¼â™¤âœ�âœˆâœ‡âœž), bullets (â—‰â�–â˜…âœºâ�‚), and other characters. Yes, you can insert such characters in other word processors, but none of them make it this easy. 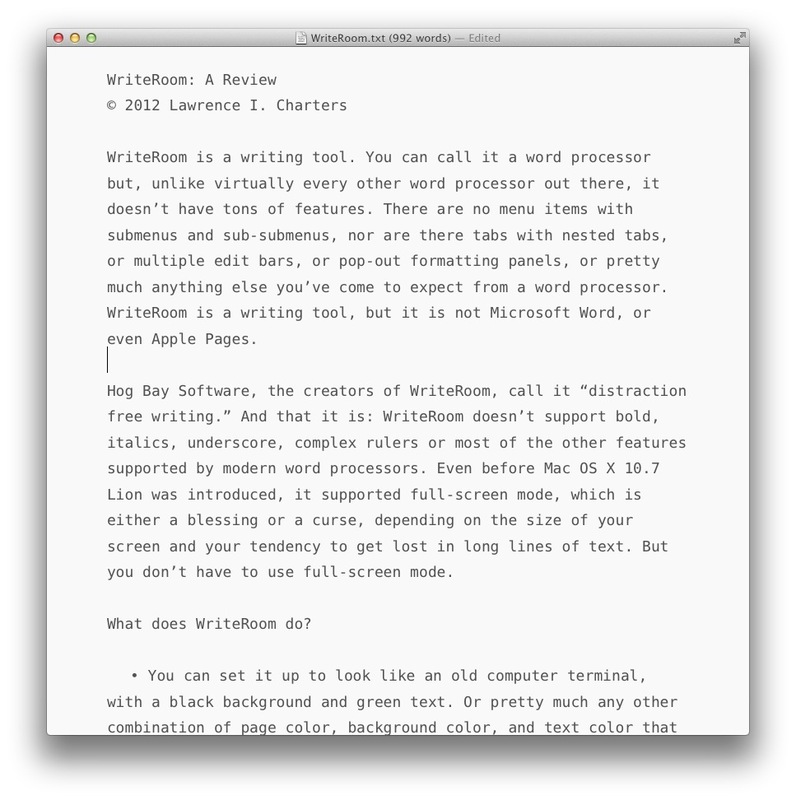 Many of the features, such as the ability to use the built-in Mac OS X speech synthesizer, are due to WriteRoom's excellent support for Apple's programming interfaces. For example, if you highlight a word and then press Command-Control-D, this displays a dictionary entry for a word. WriteRoom configured to look like an old cathode ray terminal for a mainframe. You can almost hear the machine gun rattle of the line printer in the background. Click on image for a larger view. What does WriteRoom not do? If you want an automatically generated index of every section of your document, no, WriteRoom can't do that. If you want to obsessively track changes made in a document by a team of reviewers, no, WriteRoom can't do that. If you enjoy stopping your writing to painstakingly italicize every foreign word or phrase, or bold text or underline text or change fonts, WriteRoom is not the tool for you. If you absolutely must insert a photo of a kitten into everything you write, you must look elsewhere; WriteRoom doesn't support graphics at all. WriteRoom configured with dot matrix letters for a real retro look. Click on image for larger view. If you want all the fancy formatting preserved from one document to the next, no, WriteRoom can't do that, either. 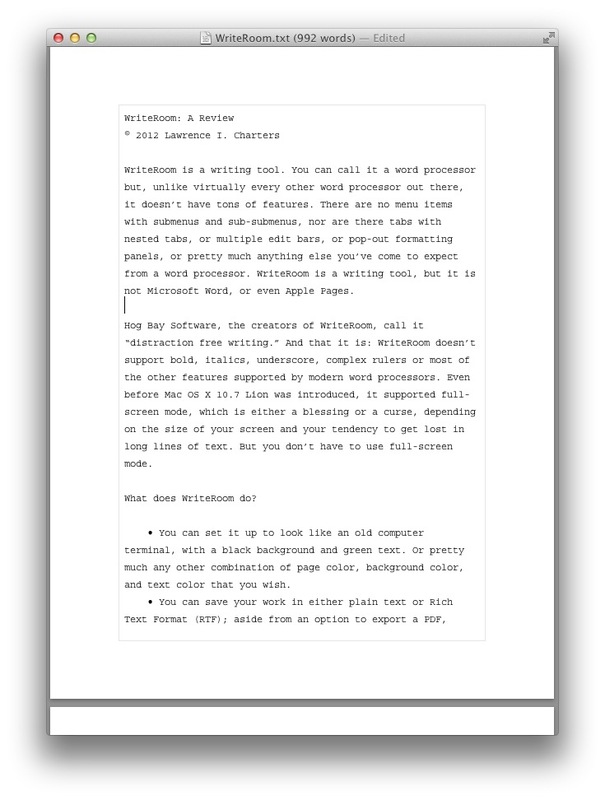 In fact, while you can import a Microsoft Word document into WriteRoom, it will import almost instantly -- but any fancy formatting will vanish. 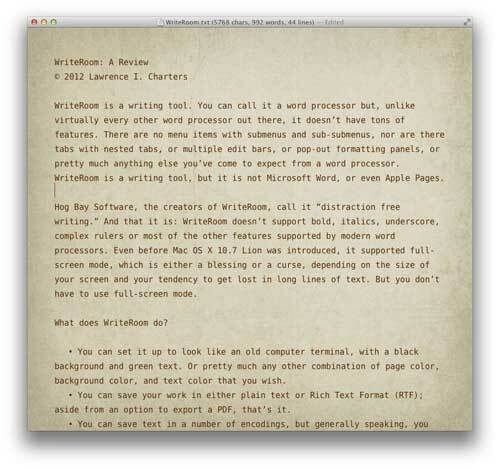 WriteRoom configured to look like a typewriter, only without the risk of all the keys jamming together. Click on image for a larger version. If, on the other hand, you find the constant tinkering with formatting to be a distraction, WriteRoom is a breath of fresh air. Think of it as the simple word processor you first used when you got your Apple II or TRS-80 or Atari 400 or IBM PC or Mac Plus -- but with the speed and power of a Mac OS X-based computer. Everything -- typing, search and replace, scrolling, copy and pasting -- happens at blazing speed, without funky menu choices or dialog boxes or quirky pauses. 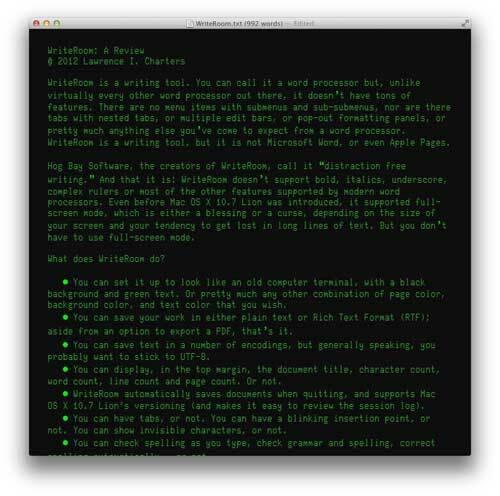 Because WriteRoom can save in plain, ordinary text, it comes in very handy for writing small scripts, or editing text for the Web. Because it loads very quickly â€” none of that wait for Microsoft Word to do whatever the heck it does and Pages to do whatever it is doing â€” it is something you are encouraged to use. Speed may not be everything, but it does get the attention of the impatient among us. WriteRoom figured with a plain white background and plain white text. Nothing fancy, nothing distracting. Click on image for a larger version. There isn't a heck of a lot more to say about WriteRoom. It is fast. It is simple. It is, within the design limits, flexible and configurable. Unlike most word processors, figuring out how to configure it is obvious; there are no hidden options. The manual is only ten pages long -- including the cover sheet, table of contents and credits. It is also inexpensive: $9.99. Hog Bay also has versions of WriteRoom for the iPhone and iPad, for $4.99, which I haven't seen but am giving serious thought to purchasing. A simpler editor, PlainText, is available for the iPhone and iPad for free. Yes, minimalist is sometimes that good. I wrote this review in WriteRoom, in less than half an hour. Just formatting it with Word for the Journal took longer.